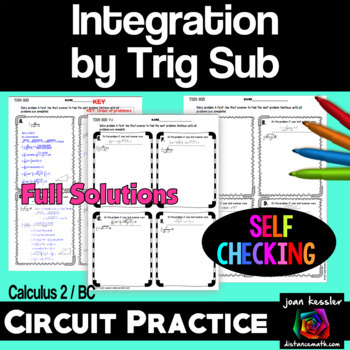 Challenge your students with this self - checking circuit training style worksheet on Integrating with Trig Substitution. 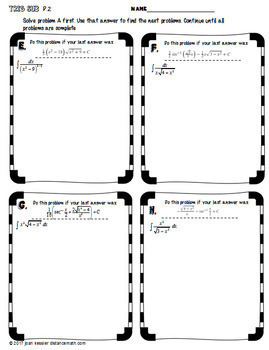 After solving the first problem they look for the answer on the handout and that leads them to the next problem. There are 8 integration problems for them to complete with room to show all work. This resource can be used for class work, independent or grouped, HW, enrichment, or an assessment. Appropriate for AP Calculus BC and College Calculus 2, this is part of the Techniques of Integration Unit. 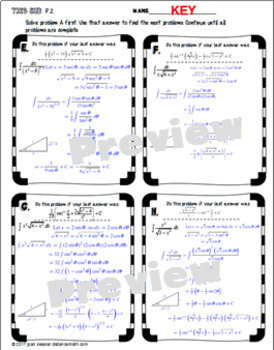 Note: your students need to have completed the section on Trig Integrals in order to solve these problems. The FULL SOLUTIONS are included so this is NO PREP for YOU! The solutions are typed. This activity can also be cut up and used as a scavenger hunt if you would like your kids up and moving for a change. Since at this level of math, I usually give them the answers, this makes it much more fun as they will soon know if there was an error. ⇒ Click on the green star near my name on the top of any page in my store to become a follower and be the first to hear about my freebies, sales and new products designed to help you teach, save you time, and engage your students.